Taking a vacation is fun. Packing for said vacation? Well, not so much. Knowing which beauty products to pack (and how much of them) can be a bit overwhelming. We’ve comprised a list of ten tips to help ease your anxiety and ensure you bring exactly what you need on your next trip! 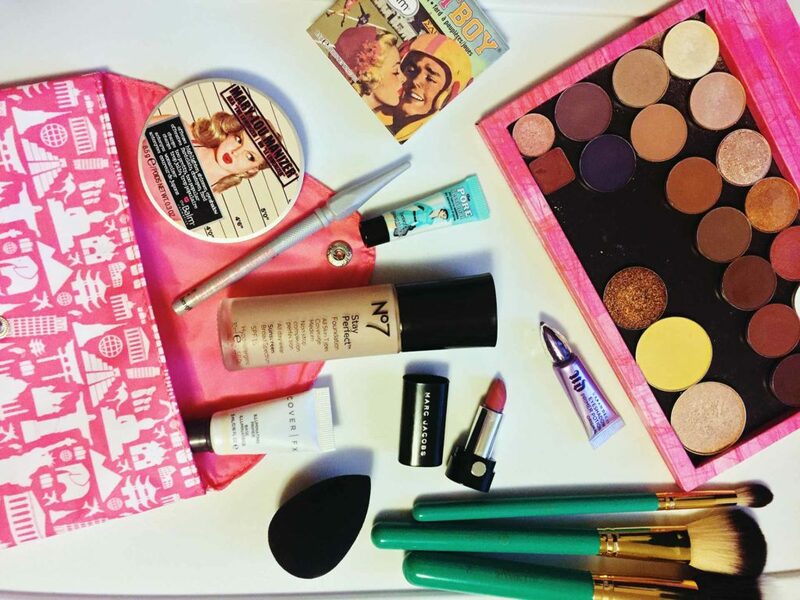 The most important thing when packing your travel makeup kit is to have a quality makeup bag. You want to look for something that will allow you to carry a decent amount of products & tools while making it easy to see everything in a glance. Look for a bag that has transparent or mesh pockets, it will make ALL the difference. As a makeup artist, I can’t begin to explain to you how important having sheer containers and bags are – they’re legit a lifesaver and help me find things faster in my kit. You’re going to be busy on your trip, and don’t need to waste time dumping out the entire contents of your bag looking for a particular product. Once you’ve scored a quality makeup bag and are ready to start thinking about the products, grab a pen and paper and walk yourself through each step of your daily makeup application routine. Make note of the items you grab for the most. Do the same exact thing for your go-to evening look. Chances are you’ll be going out to at least one nighttime event on your trip, so I would plan accordingly (ie: bring one darker lip product and darker shadows). Jot down these items as well. The products you have written down are the bare minimum you want to have on hand during your trip! 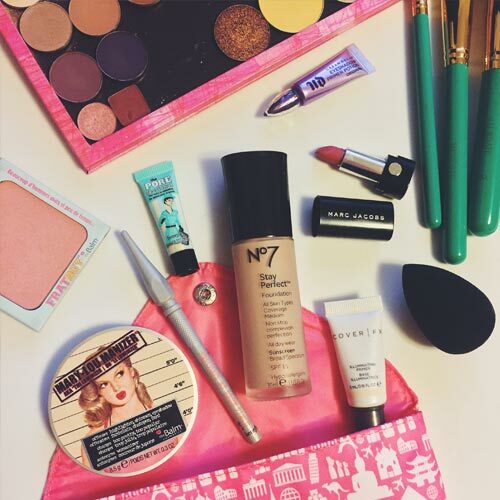 The destination of your trip also needs to be taken into consideration when packing your makeup bag. If you’re going to be swimming and outdoors most of the time, you likely don’t need to pack as much makeup, just waterproof (and possibly SPF). If you’re traveling somewhere where you may be fine dining, wine tasting, going to shows or partaking in the nightlife activities you’ll likely need to bring more. Vacation is not the time to test the waters with new beauty products (unless you buy some on the trip, of course). Go for products you already use and know work well for you. Cakey/discolored makeup or an allergic reaction is the last thing you want to worry about on your trip! Even if you’re a huge makeup connoisseur like me, it’s vital to take a step back and bring only what you need. For things such as mascara, concealer, bronzer, foundation, blush & powder – you really only need to bring your ONE absolute favorite product. Trust me, we don’t need 4 mascaras. I know, it’s rough. Making the most of out limited bag space is going to make your life, and trip, a hell of a lot easier. How does one do this? Organization, downsizing, and de-potting, of course. Got a huge tub of loose powder? Buy a small plastic container to keep some in instead of carrying the whole lot. Looking to bring a wide range of eyeshadows, blushes, bronzers & highlighters? Depot them (remove the product from the original packaging, except for the metal pan they come in) or buy single pans and get a Z Palette (magnetic customizable palette). Travel sized products are your friend. You won’t need much on your trip, so if you can afford to buy yourself a secondary, smaller version of your favorites I would highly recommend it. What’s nice about having the travel sized products is that you can keep the products right in your travel bag for next time, granted they won’t expire before your next trip. If you’re going to be flying to your vacation destination it’s important to research the rules and regulations your airline has in place for allowable sizes ahead of time. This way you’ll know what you can and cannot bring, and how much of it. Your airline should have a list of what they allow on their website. If not, you can give them a call and ask. 9) Will You Be Tanning? This one may seem kind of out there, but it’s something that can be easily overlooked. Some women tan rather quickly, especially when sunbathing frequently on vacation. Nobody want’s a white face and tan body, right? If you seem to tan fast and think your foundation shade may change over the course of the trip, you may want to bring 2 shades of foundation just in case, one in your current shade and another 1-2 shades darker. If you get a little tan, but not AS tan as the darker shade just a mix a little bit of the darker foundation in with the lighter for a custom shade. It’s important to take your clothing into consideration when packing your makeup bag, as you want to make sure your makeup and outfits compliment each other. For most women, carrying a few neutral shades of eyeshadow and lippies should be just fine, but if you’re more of a crazy colors girl, it’s imperative you choose colors that will flatter your wardrobe. Let us know what your must-have travel products are, and if you find any cool cruelty-free products abroad! These tips are so helpful! Thank you!